Books, tea and sunny weather – what more could you want? Cath Skipper is librarian at Campbell College, Belfast. She blogs here about her role as a judge for the 2014 Carnegie & Kate Greenaway Children’s Book Awards. The Easter holidays are finally here, and so I am writing this from a campsite just outside Aberystwyth in sunny Wales. 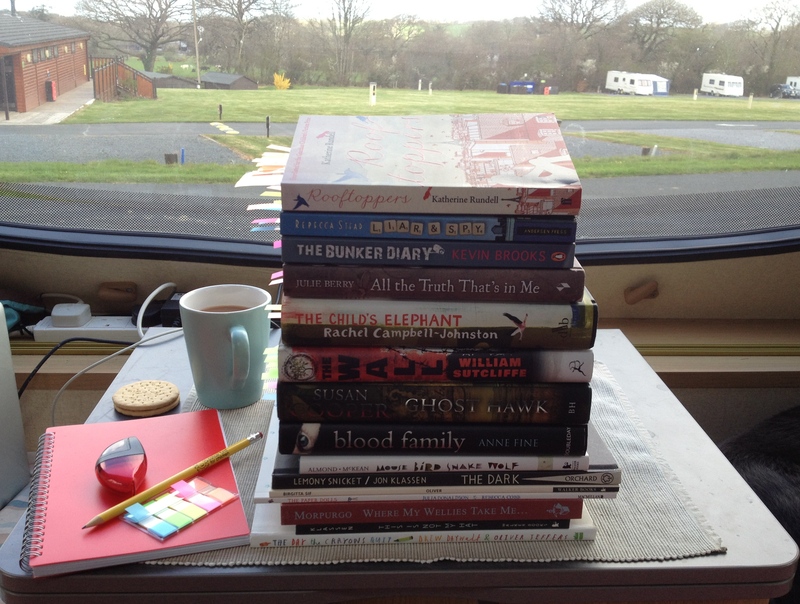 I have little light reading with me in the form of the CKG shortlists; a supply of teabags and biscuits; and sticky notes and pencils to keep track of my thoughts. Along with a few walks with the dogs, what more could you need for a perfect holiday?! My first year of being on the panel of CKG award judges has been hugely enjoyable so far. As an already out-of-control book addict, the opportunity to be part of such a prestigious book award is very exciting, and although reading every nominated book in a very short space of time was hard work, it was also very rewarding. I’ve really enjoyed seeing the reactions to both the long and shortlists, not least from my book group at school who were fizzing with excitement to find out what would make the cut. Having just taken part in our local book awards, the Northern Ireland Book Award, it’s really nice to be able to keep their enthusiasm for reading going towards the end of the school year with Carnegie shadowing. On re-reading the shortlisted books, I am even more convinced that there really is something for everyone on the lists. All of the contenders are very strong, and I really have no idea how we are going to decide a winner… Time for another cup of tea, I think!